After another breakfast of fried egg and toast (the bread was very sweet) we boarded the bus for a quick 20-minute drive to just outside the village of Gubeikou. Here we started with our now traditional daily stretches and walked through the local village and farmland, where we met many of the local people. The temperature by now had warmed up considerably, and as we approached the path taking us alongside an unrestored yet well-preserved section of the wall, we were able to stop and take a breath and a much-needed rest. I was surprised by the sheer challenge of climbing various sections of the wall. They were varied and very steep in parts but, motivated by the friendships we were making, we supported one another. Everyone on the trip raised funds for a number of different charities, and some inspiring stories were shared. 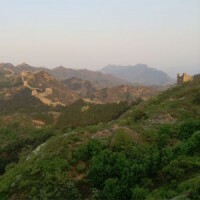 As we climbed we came to a section of what appeared to be almost brick-like construction and dated back to the Qing Dynasty – the last dynasty to rule over this vast land. We followed a track down into the valley, with rolling countryside and lush green trees. The blue skies were above us, but the heat was at times unbearable for some. In order to skirt a Chinese military post we had to divert and follow dirt paths through some trees and undergrowth before rejoining the wall again. At this point there were a number of steep sections and we helped one another out with words of encouragement and support, always regrouping as others marched on in the blistering heat. 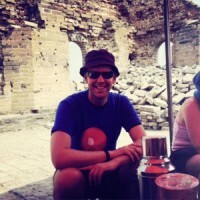 As for me, I was starting to tire and my feet were throbbing, but I was motivated by the stunning views of the Great Wall snaking along the hilltops. These views kept us going whenever we found it tough. 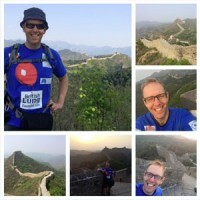 It's these memories that will remain with me forever – special memories of not only a challenge to raise money for charity but also personal challenges along the way, and there were many! The approach to the final stretch to Jinshanling was on restored wall with lots more steps, which, if I haven't told you yet, were uneven, tall and short, and had no consistency to them. This made every step a great challenge. A short walk further and we descended down the mountain through the village. We met locals and said hello (in Chinese of course). We arrived at the accommodation with a bit of time to catch the sunset and to re-climb part of the wall. I'm not really sure that words or the picture can describe how magnificent and beautiful it was – a time and place for reflection and to think about home, my family and my dog, which at the moment seemed a long way away. After dinner I returned to the room to attempt a shower. However, the ways of living are very different in China and so, another personal challenge was achieved. After waking at 6am most days, today we had a much needed lie-in. Breakfast wasn't until 8am. After making our packed lunch, which for me consisted of a few hard boiled eggs and some sweet bread, we set off from the hotel and headed towards the wall, passing many women trying to sell each of us a Chinese bag or book. We pleasantly said no and they moved on to another member of the group. Today’s stunning walk was on a largely restored section of the wall and took us from Jinshanling towards Simatai. Jinshanling is generally a tourist part of the wall and there was a lot of investment going into the development of that area, and you could see why. We made our way up the carefully restored steps that took us high into the mountains and back onto the wall. There were a few sections on older bricks and some dirt tracks, but for most of the day we walk on flagstones. Many of the steps, like in other places, were crumbling away. It was hot and humid and the scenery was superb, with rolling purple hills fading into the distance. The smog from Beijing glistened across the haze. We continued to climb uphill a good deal and made several stops, allowing for a re-group and stop in one of the turrets for a well-earned bottle of frozen water costing 10 yuan (approximately £1). Having walked to the highest point, we were able to enjoy the views of the Great Wall where it clinged precariously to the rock face opposite, dotted with many watchtowers – classic ‘scales on a dragon’s back’ scenery. 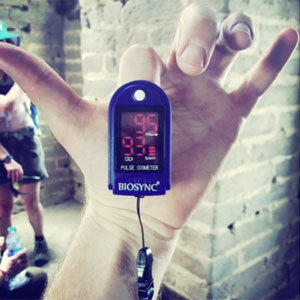 I stopped to check my oxygen levels, which I had been doing all along the way - always it was in the high 90s. But after the day's hard walk, they were 92% on air (increasing to 93% by the time I took the picture). We proceeded further along the wall and met an English couple who asked us about the trip. I explained to them about our Charity Challenge, which inspired the woman to get out her purse and give me some yuan to donate to the British Lung Foundation – this I took with thanks. Another moment of kindness. So proud to be wearing my British Lung Foundation t-shirts throughout the China Challenge. After some lunch and time to soak up this breathtaking panorama as well as to catch my own breath, we left the wall behind and headed down on small paths through forest and farmland. We then met our waiting transport, which took us to some busy motorways where again we could see investment in new roads and buildings. We got to our next stop, Mutianyu. I'm not really sure who will read this blog but for me it is important to tell my sponsors and supporters about the challenge as it happens because it was much more physically demanding than I thought and there have been many other challenges along the way, not just the walk. What an amazing experience I've had. Most importantly, I met a group of inspiring people all of whom were undertaking the wall for charity, supporting hospices, local cancer charities and Macmillan Cancer Support. Supporting the British Lung Foundation is a true honour and something that I will never forget. Thank you again for your support. I hope to have a final blog in a few days and that you have enjoyed reading a little of my adventure so far.